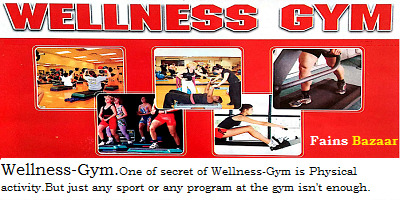 WELLNESS GYM's owner is Mr.
One of The secret of Wellness- Gym is Physical Activity. But Just any sport or any Program at the gym isn't Enough . Each and Every Member of Wellness-Gym can Enjoy a more wide-ranging project of harmony Between Body and mind , Which ranges a Personalised Training program to the Study of an Ideal Lifestyle. Strength Training equipments- MultiGym , Body Master , Hammer Strength.